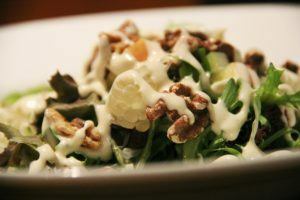 In a large bowl, whisk together mayonnaise, sour cream, and Worcestershire sauce. Season with mustard, garlic powder, salt and pepper. Stir in blue cheese. Cover and refrigerate for 24 hours before serving.